(Heather Clark – Christian News Network) One World Trade Center, the site where nearly 3,000 Americans were killed by terrorists in 2001, was ordered by New York Gov. 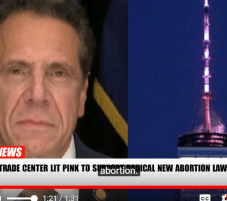 Andrew Cuomo to be lit pink on Tuesday night to celebrate the passage and signing of a bill that not only codifies, but also expands abortion access in the state. New York law will now allow for the murder of the unborn until birth if the child is not expected to survive or if the pregnancy is deemed a threat to the health or life of the mother.